A New Ham I Am! 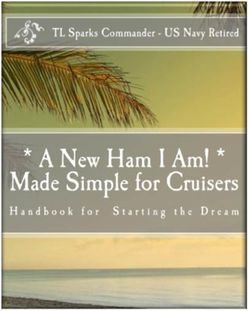 A new Ham I Am - Made Simple for Cruisers will help a new Hams bridge the gap between getting a license and using the license. There are two different types of Hams. There are "Hams who go Cruising and Cruisers who become Hams." Cruisers that become Hams will typically use High Frequency Single Sideband (HF SSB) radios as a tool and not as a Ham station. HF SSB radios provide a method for cruisers to communicate with other cruisers, get information and email. In an emergency HF SSB radio is probably the best tool to get the fastest help. Networking on HF SSB communications nets provides excellent practice in using and understanding the anomalies of HF SSB radio. Being a part of the nets also allows you to get to know other cruisers even if you have never met them. Cruisers in foreign countries may not speak the local language; understand the culture; or the laws! If you need help, getting to know other cruisers via HF radio can be important. If you are cruising you will need help at some time. HF radio allows you to know other people before you need them! When you have a Ham License, you become the “resident radio expert”. As a result, this book also contains some of the basics for using the Marine Band frequencies including methods of calling for help in an emergency.